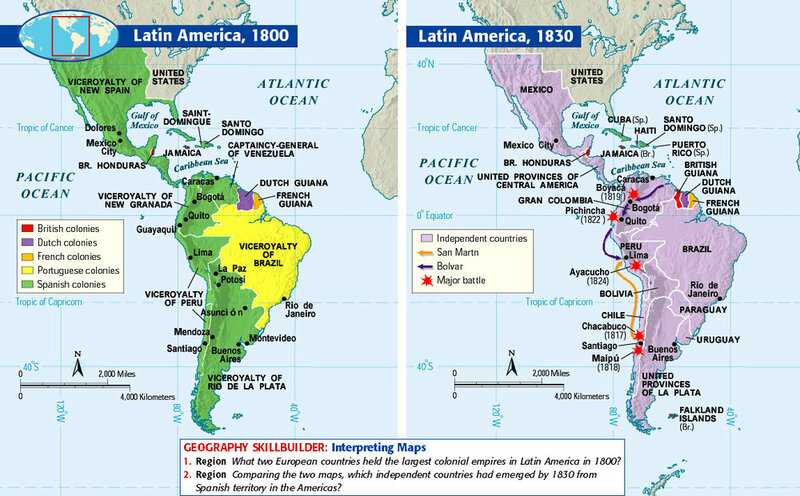 The Latin American Wars of Independence were the various revolutions that took place during the late 18th and early 19th centuries and resulted in the creation of a number of independent countries in Latin America. These revolutions followed the American and French Revolution, which had profound effects on the Spanish, Portuguese and French colonies in the Americas. Haiti, a French slave colony, was the first to follow the United States to independence, during the Haitian Revolution. Creoles in South America, led by Simon Bolivar, followed with revolutions of their own gaining independence for the rest of Latin America. A major element of the economy was the mining of precious metals for export. Encomienda – the right to organize unpaid labor by the earliest Spanish colonists in Latin America. Revolutions in the Americas were led by native born men of European background (except for French Haiti) who were able to rally the population to the cause of independence. Slaves in Haiti rebelled, abolished slavery, and won independence. Father Miguel Hidalgo started the Mexican independence movement. Independence came to French, Spanish, and Portuguese colonies. Former slave who led Haitian rebellion against French. Defeated the armies of three foreign powers: Spain, France, and Britain. At first, Haiti tasted freedom, but after L’Ouverture’s death, it fell into despotism. Liberated the northern areas of Latin America. Native-born resident who led revolutionary efforts. Tried during the 1820s to bring regions together under a federal constitution modeled after that of the United States. The plan failed because of the differences of the Latin American peoples. Monroe Doctrine was issued by American President, James Monroe in 1823. The document was backed by the British government as well. Latin American nations were acknowledged to be independent. The United States would regard as a threat to its own peace and safety any attempt by European powers to impose their system on any independent state in the Western Hemisphere. The United States would not interfere in European affairs. The document continues to be a cornerstone of American foreign policy. Click above to begin a quest for knowledge on the Latin American Revolutions. The representatives of The 95 are pictured below. Click the banner above for the complete list.